The poems in Jonesing For Byzantium are loosely combined into an ode to the Piedmont skree, both human and natural, that inhabits my countryside in Georgia (USA): the dark and the light; the reds and greens; the living and dead. These pieces attempt to communicate how the remoteness of the rural American South ultimately relates to the outer and inner realms of the poet and reader alike. L. Ward Abel is rarely wordless. He confronts the world head-on, with nerve, with clear-eyed wonder, and with the tools (language, soul) to translate it into benevolent recognition. The poet engages with the world; he does not balk, he does not look away. Jonesing for Byzantium is an opera, a drama of voice and music and beautiful words. The natural world that Ward Abel inhabits, and gives us generously, is a place of rare beauty, teetering magisterially between the sacred and the mundane. Taken separately, each poem here is lovely, self-contained, specific, as crisp as the sound of tires on a wet, rural road, and as rooted as his Georgia kudzu. They represent the place “where math meets jazz.” Taken all together, these poems are one long hymn to a universe both welcoming and befuddling. Abel’s is a voice that doesn’t just cry in the wilderness…it sings. 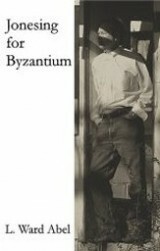 “Ward Abel’s latest book of poetry, Jonesing for Byzantium, is a very personal peek into the mind of a poet. It is not easy to categorize Abel’s work because it does not hold with the usual categories, nor is it ‘experimental’, in that connotation. Rather than being language for the sake of language, it appears to be language used for a specific purpose—to connect and explain in myriad ways the process by which the poet experiences his universe. The reader feels pulled into the thought patterns and subjects, in an accessible, non-academic journey, and yet it is still ephemeral in some muted, secret way, so that there’s shimmer, light and shadow where the obvious might have been thrust at us. One is reminded of music with the blending of notes, the subtleties of segues, and the dream-like quality of the poet’s stance. His language is his own and it’s no-nonsense without ever getting heavy handed. — Beverly Jackson is a poet/writer/editor/publisher of Ink Pot (literary journal) and Lit Pot Press, Inc.